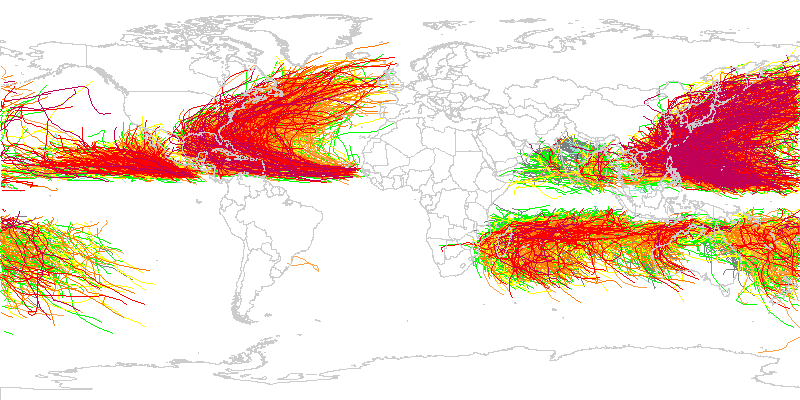 IBTrACS storm tracks for seasons 1947 through 2007. The International Best Track Archive for Climate Stewardship (IBTrACS) dataset was developed by the NOAA National Climatic Data Center, which took the initial step of synthesizing and merging best track data from all official Tropical Cyclone Warning Centers (TCWCs) and the WMO Regional Specialized Meteorological Centers (RSMCs) who are responsible for developing and archiving best track data worldwide. In recognizing the deficiency in global tropical cyclone data, and the lack of a publically available dataset, the IBTrACS dataset was produced, which, for the first time, combines existing best track data from over 10 international forecast centers. The dataset contains the position, maximum sustained winds, minimum central pressure, and storm nature for every tropical cyclone globally at 6-hr intervals in UTC. Statistics from the merge are also provided (such as number of centers tracking the storm, range in pressure, median wind speed, etc.). The dataset period is from 1848 to the present with dataset updates performed annually in August. The dataset is archived as netCDF files but can be accessed via a variety of user-friendly formats to facilitate data analysis, including netCDF, Shapefile, and CSV formatted files. The update to version 3 data includes new data sources, bug fixes, shapefile-support, discontinued support of ASCII and new variables. Cite as: Kenneth R. Knapp, Scott Applequist, Howard J. Diamond, James P. Kossin, Michael Kruk, and Carl Schreck (2010). NCDC International Best Track Archive for Climate Stewardship (IBTrACS) Project, Version 3. [indicate subset used]. NOAA National Centers for Environmental Information. DOI:10.7289/V5NK3BZP [access date]. Search and download IBTrACS data in specified formats. Dynamic GIS mapping application to locate tropical storms. Download data and documentation for dataset via FTP. Interactive WMS Map Tool for IBTrACS Storm Tracks. PDF document describing the IBTrACS storm serial number format (12KB). The serial identification number contains detailed storm information specific to its genesis: calendar year, day of the year, hemisphere (N or S), and latitude and longitude. Summary of changes for v03r06. Summary changes made to previous versions of IBTrACS with links to more detailed information. Version 2 of the dataset has been superseded by a newer version. Users should not use version 2 except in rare cases (e.g., when reproducing previous studies that used version 2). Purpose The major constraint in improving scientific understanding of the observed trends and variability of tropical cyclone activity has been a lack of accurate, quality controlled best track data for all tropical cyclone basins globally. Lineage Statement Data were obtained from numerous sources. Upon receipt of the electronic files, data were converted to common format (netCDF). Thereafter, numerous merging procedures were implemented, including an assessment of storm position, the identification of unique storms, and an accounting for a variety of storm tracks, storm splits, and storm mergers. An automated algorithm was developed to identify storms tracked by multiple centers by sorting storms in time and space. Any observations at identical times and within 111 kilometers, were identified as identical storms. Once a TC was identified as unique, a storm serial number was created which distinctively numbers the storm. IBTrACS algorithms read all the individual storm tracks from the merged files and create one combined storm track with a single position, wind and pressure every 6 hours (at 00, 06, 12 and 18UTC). Objective automated quality control algorithms were developed and incorporated for the maximum sustained wind and minimum central pressure for each tropical cyclone and time step. These data are in netCDF, with one file per cyclone. Statistics from the merge are also provided (such as number of centers tracking the storm, range in pressure, median wind speed, etc.). Any observations at identical times and within 111 kilometers (approx. 1 degree latitude) were identified as identical storms. In order to create a dataset that was globally homogeneous, the maximum winds are standardize to a single 10-minute averaging period as it is the global standard set by the World Meteorological Organization. For more information, please view documentation for Version 3 of this dataset.